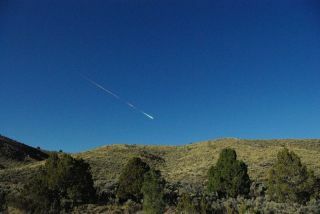 A fireball flits through the sky above Reno, Nevada on April 22, 2012. It’s official! A fishing license for the sky. The Bureau of Land Management, under the U.S. Department of the Interior, has issued Instruction Memorandum No. 2012-182. It establishes policy governing the collection of meteorites found on public lands. The policy, issued Sept. 10, provides guidance to the BLM’s field office managers for administering the collection of meteorites on public lands in three "use categories," said Derrick Henry, a public affairs specialist for BLM in Washington, D.C.
"The policy recognizes that there is interest in collecting meteorites by hobbyists … but it also is recognition that there are science and commercial interests as well," Henry told SPACE.com. A close-up of the Sutter’s Mill meteorite, a fragment from a daytime fireball that exploded over parts of California and Nevada on April 22, 2012. This fragment was discovered in a horse pasture outside Lotus, Calif.
As noted in the new policy, the extraterrestrial origin of meteorites, as well as their relative rarity, "has made them highly desirable to casual collectors, commercial collectors and scientific researchers." The document goes on to note that "recent media attention has increased … confusion about the legality of and limits to casual and commercial collection. Courts have long established that meteorites belong to the owner of the surface estate. Therefore, meteorites found on public lands are part of the BLM’s surface estate, belong to the federal government, and must be managed as natural resources in accordance with the FLPMA of 1976." "We tried to account for every kind of occurrence out there," said Lucia Kuizon, national paleontologist at the BLM in Washington, D.C. "We felt the policy helps the public understand the issues, as well as for our own resource specialists out in the field when they get inquiries." The policy for commercial collecting is new, Kuizon told SPACE.com. "Prior to the instruction memorandum, we did not allow commercial collection of meteorites," she said. "The details of how to go about obtaining a permit and what it will cost can only be determined by submitting a proposal to the field office where the activity will take place, and then fees and other costs are calculated. "Most collectors are probably 'small businesses,' and because the activity is more surface collection after a fall, the application fees should be reasonable," Kuizon added. "The fair market value would be calculated by the appraisers in the state office." NASA Ames and SETI Institute meteor astronomer Dr. Peter Jenniskens collects fallen meteorites using aluminum foil, to avoid contaminating the stones by touch. In the world of meteorite collecting, the new rules have sparked a flurry of comment on the Internet and on a special mailing list dedicated to the topic. "I have mixed feelings about the new BLM guidelines," said Michael Gilmer of Galactic Stone and Ironworks, in Lutz, Fla. "I think this is all about money. Meteorites flew under the regulatory radar for a long time." "I think it is good that BLM is trying to preserve the land, but they are schizophrenic in how they preserve the lands," Gilmer told SPACE.com. "They want to discourage meteorite hunters, but at the same time they allow large commercial mining interests to lease the land for exploration and exploitation. I think the mining companies do more damage than any meteorite hunter." Gilmer said that if the BLM decides to rigorously enforce these guidelines, "then it will negatively impact the recovery rate of all meteorites … old finds and new falls alike." The general consensus around the meteorite world of dealers and hunters, Gilmer added, is that the new rules are worrisome. However, "it varies from office to office, and a lot depends on the director of that particular BLM area. Some of them are more lenient than others. So I expect enforcement of the regulations to be spotty and inconsistent," he said. What is needed is increased cooperation between private hunters and officially sanctioned hunters, Gilmer emphasized. "Ideally, the BLM should encourage meteorite hunting … but this is what happens when bureaucrats pass down new regulations without having any knowledge of how the meteorite market operates." According to Arizona-based meteorite hunter Jim Wooddell, the BLM’s new rules clarify much of what the meteorite hunting community already knew. "However, I want to point out that local policy for any specific area could be different based on the local land-use plan, which I think is the ultimate policy for a given area," he told SPACE.com. Wooddell said two things are imperative: "First, the local authorized officers need to be educated in the collection of meteorites and, of critical importance, the need to recover fresh fallen meteorites as soon as possible." Second, based on conversations with BLM representatives, Wooddell said institutions – such as those that study and curate meteorites – can and should proactively file permit applications that cover an entire state. Doing so would allow them, or their volunteers, to collect meteorites immediately after a fall. Still, this is up to the authorized officer for the state, he said. "The bottom line is that no one has any rights to collect meteorites on federal lands for profit or for science without permission from the BLM in the form of a permit," Wooddell said. "Science and profit seekers are those affected the most. It was made apparent the BLM knows who many of them are. Time will tell how this works out."